It ain't easy to make it in the concert biz—just ask the folks at the struggling Fox Tucson Theatre, or the UA kids who lost close to a million bucks on a Jay-Z show earlier this year. 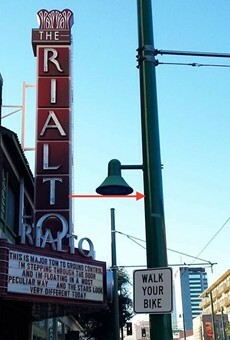 The Rialto Theatre has suffered through its share of recent political troubles, but that hasn't stopped the folks there from continuing to bring great acts to Tucson, including Andrew Bird, Lucinda Williams, DeVotchKa, Animal Collective, the Avett Brothers, The Faint and so many others. Huge props to general manager Curtis McCrary (who, it should be noted, is also a longtime Weekly and Best of Tucson® contributor), whose hard work has pushed the Rialto into the list of Pollstar's Top 50 venues. Keep on rockin'.